I have a problem with an early Pace Bantam. It's the one with a single jackpot, that has JAK POT on the front of the casting. The machine that I have here for repair is a 10 cent machine. It is missing the top 4 coin jackpot slide. It is also apparently missing some linkage that would reset the jackpot. I have the coin tube. I just removed it, so as to better see the area where the parts are missing. 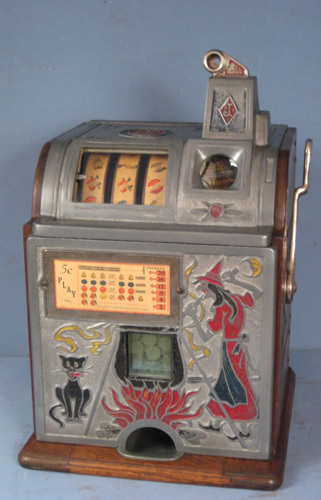 What I am hoping for here, is that someone in the forum has a like machine, and would be kind enough to take a picture of the area on the mechanism where the trip for the jack pot is located on the top slide and what resets the jackpot. I know that this is a reach, but if someone might have those parts as spares, and would be willing to sell them, I would be VERY appreciative. Pictures are below. Thanks for the info jslots. The jackpot slide (if I had one) is not anywhere near where the trip on the jackpot is. There is nothing there to trip or reset the jackpot. I guess what they say is true though..........a picture is worth a thousand words, ha! I am not sure, but I think that you might be referring to a jack pot that is on a newer model Pace Bantam. The Jack Pot that I have to work with is an early version that is much more simplified, than what I think you might be referring to. See the picture, lower of the two, that I have to work with as opposed to the newer, much more complicated Jack Pot. Thanks for the picture Jim. It sure is VERY much appreciated. I was thinking that it would have to look something like that. Now, I just have to find a 10 cent slide to get it to work. I have some slides, but I don't think there are any Pace slides in the bunch.